The National Master Plan for 2007-2017 of Government of Sri Lanka (GOSL) has identified inter alia, the Central Expressway as one of the key expressways to be implemented in the near future. The need of an efficient transport infrastructure is mandatory for development. GoSL has identified the need of improving the existing land based transport systems, i.e. road and rail road transport systems. Under the improvement of the road network, the importance of developing an expressway network with inter connectivity is of paramount importance. Road Development Authority (RDA) under the guidance of Ministry of Higher Education and Highways (MoHEH) has designed a network of expressways to suit the country's emerging economic and transport needs. Few sections of this expressway network have already started their operations such as Southern Expressway (SEW) from Kottawa to Matara, Colombo - Katunayake Expressway (CKE) and Kottawa to Kadawatha section of the Outer Circular Highway (OCH). Under the directives of MoHEH, RDA has initiated a study to find out a suitable road corridor to construct the expressway from Kadawatha to Dambulla via Kurunegala under Central Expressway Project (CEP) with a link to Kandy under the phase 1 of the project, considering present and future development scenarios of the country. Under the phase 2 of the project, it is expected to extend the expressway to Northern and Eastern areas of the country. Under the phase 1, it is expected to start the Central Expressway at Kadawatha from Kadawatha – Kerawalapitiya section of OCH which is currently under construction. Subsequently the expressway will cross Gampaha, Meerigama, Kurunegala while ending at Dambulla. The Kandy link will branch off at Pothuhera and terminate at Galagedara which is about 10km away from Kandy City. 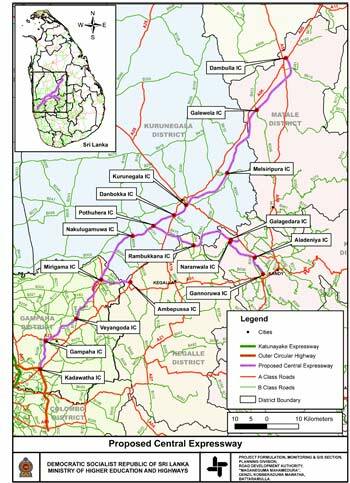 The former Northern Expressway Project (NEP) has now been renamed as "Central Expressway Project (CEP)" and its first section is to be commenced at Kadawatha on OCH phase – 3 and then to proceed up to Gampaha, almost following the earlier Colombo – Kandy, alternative Highway (CKAH) for which a feasibility study had been completed in 2001. Gampaha onwards CEP follows the same trace already being recognized for former NEP.The former Northern Expressway Project (NEP) has now been renamed as "Central Expressway Project (CEP)" and its first section is to be commenced at Kadawatha on OCH phase – 3 and then to proceed up to Gampaha, almost following the earlier Colombo – Kandy, alternative Highway (CKAH) for which a feasibility study had been completed in 2001. Gampaha onwards CEP follows the same trace already being recognized for former NEP.